Peggy Munson wrote one of my favorite Book Notes essays for her debut novel, Origami Striptease. 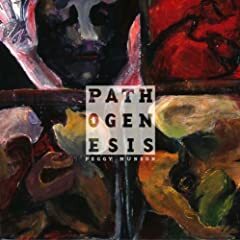 I am truly honored to have this talented writer participate in the series again with a playlist about her new poetry collection, Pathogenesis. Pathogenesis is ideal poetry for me, powerfully personal and yet global in its implications. A call to arms, these poems follow Munson's battles against the medical community and her own body as she fights Chronic Fatigue Immune Dysfunction Syndrome (CFIDS) and Multiple Chemical Sensitivities (MCS). "Peggy Munson's Pathogenesis is forthright and magical in scope. The minute ascends to the monumental -- moth to God; very little escapes the sharp, perceptive eye of this thoughtful poet. A sober music gives shape to the insistent pulse of this book, and each poem dovetails to highlight the collection's overall vision. Every trope is a probe that divines vicissitude." My friend told me today that he and his co-workers have a tradition of sending around their favorite poems in April for National Poetry Month. Historically and cross-culturally, periods of war, recession, and rampant disease have been the times when poetry was the people’s prophet. I can’t wait until poetry travels through the veins of medical humanities programs up to the cerebral cortex of medical knowledge, to lend a koan-like portal to the ineffable and miraculous aspects of healing. I love this lyric: “The lack of light, hollow sea, poisoned beaches, limousines, toothless dentists, cops that kill. Doctor Blind, just prescribe the blue ones.” Pathogenesis looks at this sick culture of pharmaceutical-laced Philadelphia tap water, trying to find a remedy. We have so much to undo to get to an authentic medicine and environmentally sound culture. I fantasize about a rebirth of William Carlos Williams-run medicine where the patient’s narrative is the red wheelbarrow so much depends upon, and Dr. House-like medical sleuths perform a dogged search for solutions. “Is the problem you’re allergic to a well-familiar name?” Some poems in Pathogenesis hint at the experience of chemical sensitivity, told partly through Gulf War vets who got too sick to wander through our brand-name society. What happens when one becomes sick from a well-familiar name (say Tide, Bounce, Sure Deodorant)? Nothing is sure after that, certainly not faith in medicine. While brand names are seared on the American psyche with delineated assuredness, those with toxic injury grow faithless about the Springtime Fresh world. It also becomes impossible to brand a migrating symptom, no matter what the medico-metaphorists fear, because it is still an unbranded pain, outside of collective consciousness. This song (I love this Trick Pony version) reminds me of my Mom in the 70’s and 80’s, when everything was lacquered in place with hairspray or photo wall murals as AIDS entered our consciousness. A grouping of poems in the book deals with blood and family in a nature/nurture debate about the body and illness. The titles are in three parts: a family member, a system of thought, and a part of the body (i.e. Self: Ornithology: The Immune System), to explore not only the heart-wrenching breaks from the triadic symbiosis of family, but how each panel of this complicated triptych informs the others. New Age philosophy constantly oversimplifies the idea of belief systems as they relate to health, but fundamentally we are all composite beings of genes, programming, and blurry attempts at self-awareness. I am fond of a technique from a Zen book that says to think of another person’s illness as “youmesick” because separateness is so often what leads to heartache, not arterial plaque. I wrote some of these poems while staying next to preserved tallgrass prairie, full of plants with lyrical names such as rattlesnake master and switchgrass, and I incorporated those plants into my poems. I am sad that the plains ecology has been decimated by agriculture, but something about the Midwest landscape, despite the toxic grid imposed upon it, still feels so vibrant and transformational. The tallgrass prairie once burned in massive fires to regrow, like a body erasing its scars and traumas, and I like to think of it one day shaking off its colonizers with a massive shocking fire like cayenne to the eyes. It’s hard to describe the psychological effects of growing up with so much spaciousness, as I did in Central Illinois. I describe the wind as the “eighth ocean,” and all of the pictures I have of my relatives look as if they were caught off guard commandeering way too much space as wind nudged up their pant legs. Listening to Chrissie Hynde sing about her sliver of Midwest disappearing is so disturbing and prescient. I like how she slowly chastises and cheers when she chants “Hey-ho, way to go Ohio” like she’s criticizing a rogue brother for crashing the car, or criticizing all of us. One poem in the book addresses the death of my cousin Paul and quotes my mom saying, “Genius never brought him joy.” Paul died in what was probably a suicide, though it was never confirmed (he had attempted suicide before). Paul was, in most respects, the elephant in my family’s living room, in that he openly expressed the misery that others were trying to politely suppress. One year for Christmas he made me a mix tape that had the theme from Superman on it, followed by some of Bach’s inventions. This was before Christopher Reeve became disabled, and I became disabled, but the idealization/devaluation that so many disabled people experience, the schism between an inflated superhero (or TV-styled supercrip) and a man unable to tend his own bedsores, would characterize much of my future life. When I learned that Pathogenesis was going to be published, I was elated, but I had also grown disillusioned with the careerism in contemporary poetry. I still believe the exercise of reading or writing poetry should be something about joy over brilliance, and I want that purity to shine through with life-saving urgency. I know Paul was seeking something that would launch him out of his pain, not the kryptonite that found him. Poetry should always be the telephone booth that turns a geek to a flying machine. “That toxic cloud in the corner must be you.” Pathogenesis also deals with the insidious onset of invisibility. Over time, I have watched a lot of people I know become ultraviolet or infrared as they are pushed out of society by experiences beyond social comprehension. Many outsiders are certainly not equipped to deal with the realities of illness and disability, so they close their eyes and minds to great detriment for the suffering, instead of finding more powerful microscopes, thus leading to a diminishing social reality where plastic surgery and dermatology are the most sought after medical residencies, and people are reduced to hiding behind veneer-bodies. The entire “This Hungry Life” album is a perfect soundtrack for Pathogenesis, full of exquisite yearning and hunger for something substantive within a world on fire. It’s one of those albums that really goes big and captures the tone of a time period. I sometimes imagine Britney is singing about our toxic culture, but I’m more interested in what she symbolizes about how sick people are treated in America. A wealthy cultural icon can be hijacked by a rogue abuser who crushes up her pills in her food, chased around a psych hospital by Dr. Phil (who is sick? ), and laughed at by thousands of idiots who don’t know illness when they see it. Britney gets the last laugh in the “toxic” video, dripping the toxic potion into her captor’s mouth. Good for Britney. This catchy nouveau French disco tune reminds me of the scene in Sicko where a French doctor is paid to do home visits at 3 am. I think every American feels terrible when witnessing the medical travesties that go on in this country, and this collective shame and guilt corrodes our society from within. Good medicine should be a vehicle for social healing instead, a means of social pride and reconstructed conscience. “I will never be the same but that’s alright. As long as I can breathe and I can move and I can sleep at night.” We all have these bottom lines demands of life: just don’t let my kids die, don’t let me go crazy, don’t take away my house. And life doesn’t even blink. Keith Jarrett recorded The Melody at Night With You album while he was sick, and there is a certain tamped sadness and cerebral torpor about the music that captures the experience of illness in ways that words just can’t. The album lights up when Jarrett plays “Someone To Watch Over Me,” which seems to hold the tearful relief that one feels when finally in caring hands. Jarrett said on Salon.com that he feared no one would be able to hear the album, as it was so subdued, which makes the idea of a witness – someone to watch over him – so powerful as he grabs at threads of recovery. “When under ether the mind comes alive, but conscious of nothing but the will to survive.” A lot of the poems are about these honed “growing points” that characterize the tallgrass prairie, illness, and trauma, how we respond when our lives burn down to nothing and there’s a small, hatching instinct to live. At one point, I found a lump in my breast and had breast surgery with only light local anesthesia (I had refused general), and I managed the pain by playing a mix on headphones. In an ironic and somewhat funny moment (I had forgotten exactly what was on my mix), Courtney Love started screaming, “There is no milk!” in my ear as the surgeon scraped the milk ducts of my breast tissue. The long title poem in Pathogenesis borrows lyrics from a couple of her songs, and states: “When Love screams f*ck you it’s like being kissed by an angel.” I think that sometimes the greatest self-love is the ability to fight as loudly as possible.